Warning: A very photo heavy post. If you didn't see the first part of this check it out here, I went through the decorations for the outside areas and the barn. 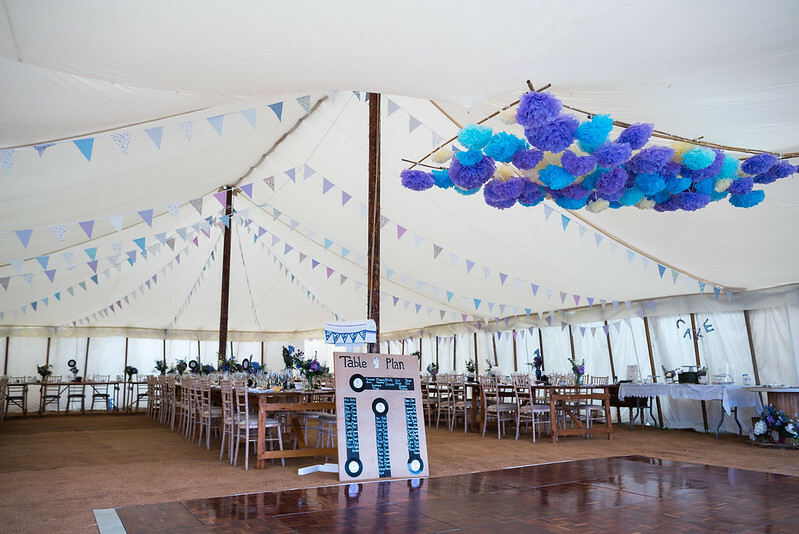 Today I am focusing on how we decorated the marquee. 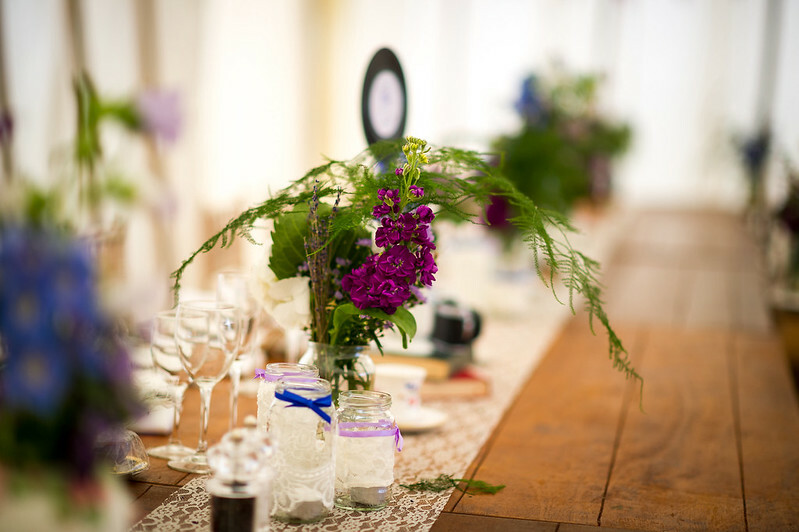 The theme of blue and purple ran throughout and again a strong vintage style was kept. The marquee was dressed with vintage styled bunting in purple and blue colours. I knew I didn't want the ceiling to look bare so there was a lot of it, this was brought over time from a seller on eBay, will add the link below. We also wanted a feature over the dance floor. I collected a load of pom poms in different shades of blue and purple, then myself and my wonderful helpers had a session gently undoing them from their packed form. I knew it was going to take forever if we individually attached them to the ceiling and I had a vision of them being very compact not spread so it was a feature. My Mum came up with the idea of creating a frame to attach them to, so using bamboo as it is so light we created the frame and then spent quite a while attaching the pom poms, we had pushed two armchairs away from one another and placed the bamboo on top so the pom poms could hang down while we attached then. I still have visions of myself lying underneath them checking there were no gaps. 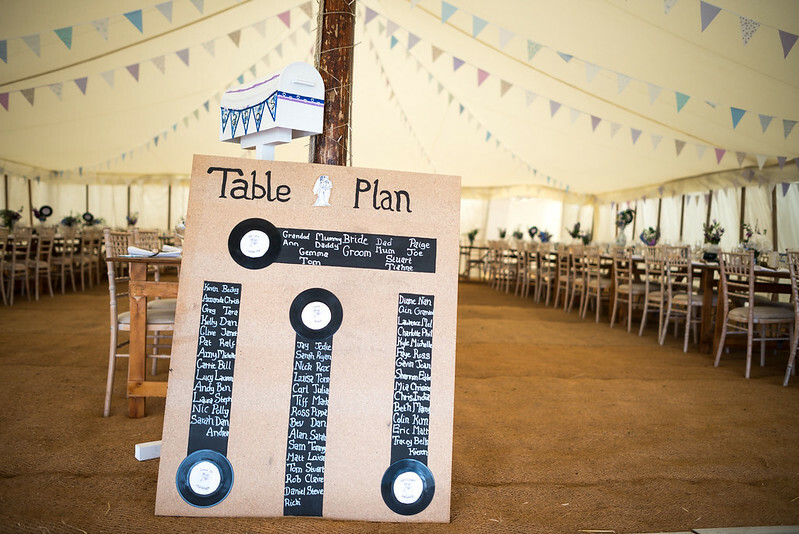 The table plan was a large piece of chipboard with the black rectangles painted on with chalk paint. I then added the small vinyls with the table name on. 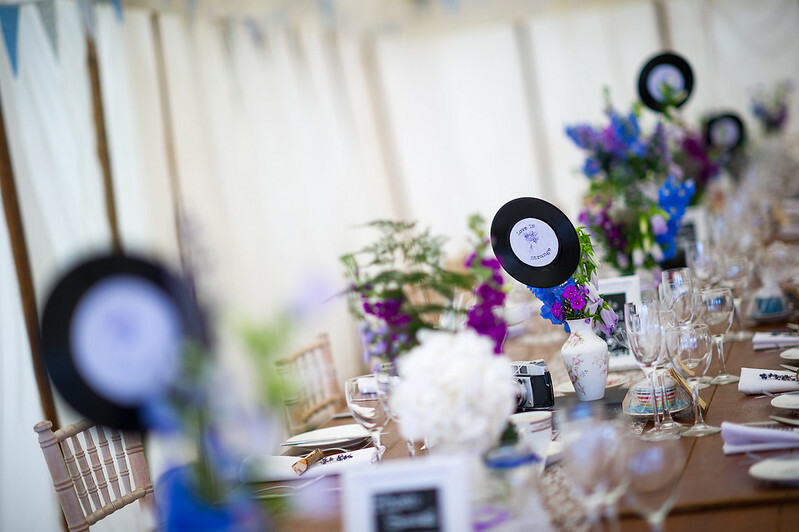 The table names were all songs from Dirty Dancing, something that was Glenn's idea. 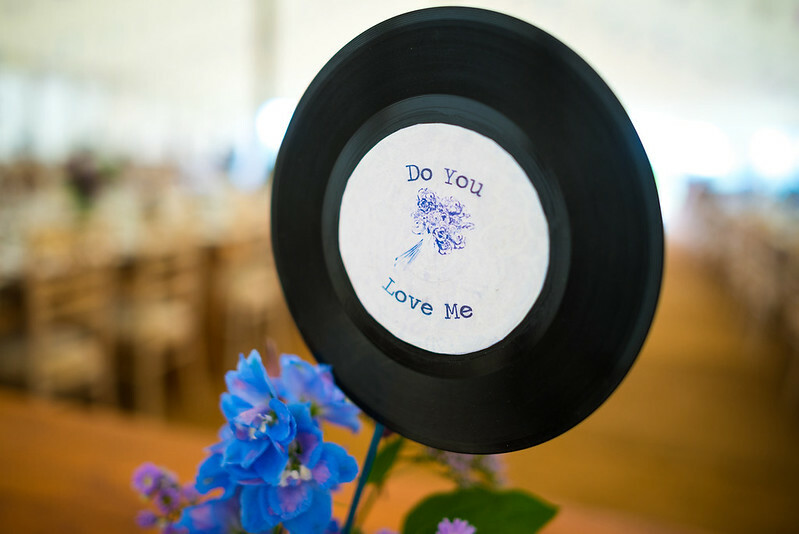 We are both big on our music but wanted the song titles to be related to love in some way and are both big fans of the Dirty Dancing soundtrack so seemed very fitting. I decoupaged these table names onto the vinyls. At the top of the table plan I also decoupaged the illustration I did that was on our invites (which you can see here). The mail box for the cards was something else I added DIY touches to. The mail box was another purchase from eBay and was very inexpensive. Glenn created a stand for it to go on and used no nails glue to fix it in place. 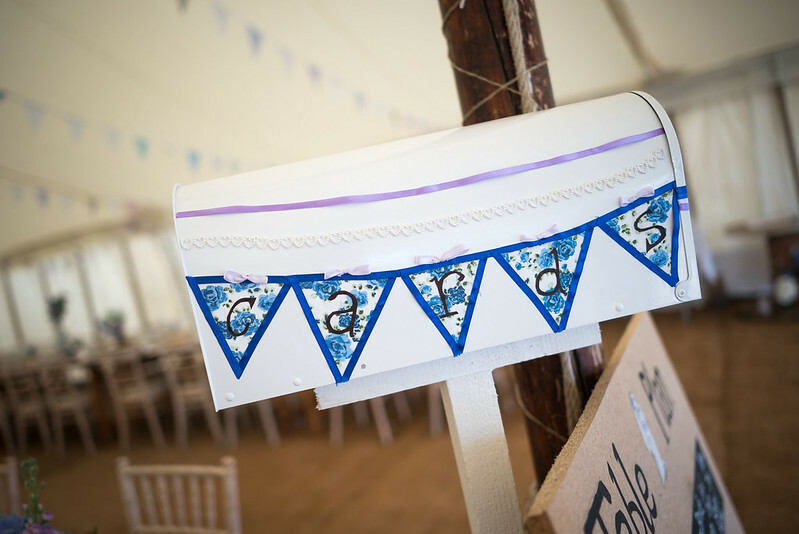 On the actual mail box I had sticked with the colour theme and created blue and purple bunting. There were also small pearl hearts to follow with the vintage feel. 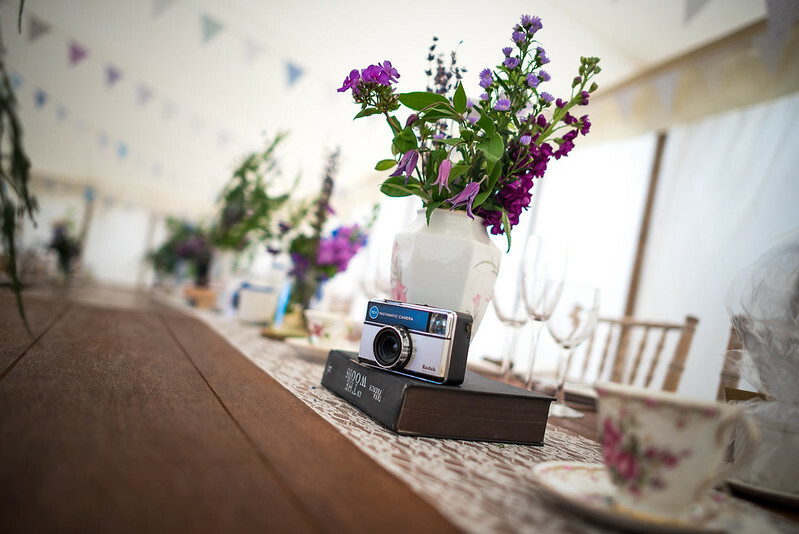 The tables were my favourite bit to decorate. I wanted them covered with lots to look at but also had a strong idea of how they should be set out. I would regularly show Glenn ideas but it wasn't until he saw them that he actually saw what I meant. So lets start at the beginning. 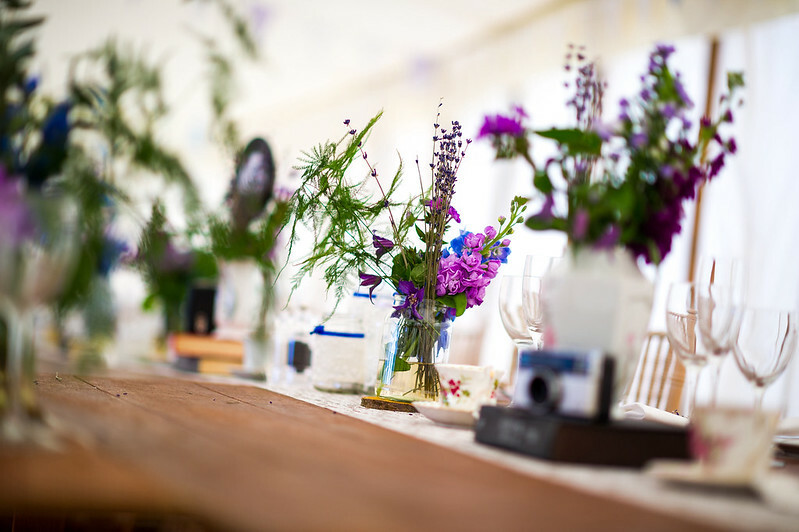 First I added lace runners onto the wooden tables, I knew we wanted exposed wood as I am not a massive fan of table cloths but they needed something to pretty them up. The lace was inexpensive and again from eBay. It was actually sellotaped to the tables. Then on top of the lace was all the items to give it that vintage feel. On top of the lace at even sections were books with a vintage vase on top. All these vases were collected from charity shops or car boots and I have still kept them all. I never wanted all the vases the same I always wanted them to have lots of different character and be all shapes and sizes. Also on top of the books was a film camera. On the top table none of the cameras had film in as I wanted everyone on the top table to chill out and enjoy themselves but on the other tables the cameras had instructions of how to use them attached. This also included a difficulty level. Something I designed myself and I am not going to lie took forever. However when I looked round the room and saw people playing with the cameras it really made smile. I still have all the films which I am going to develop just before our first anniversary. All the books were also collected from car boots or family members. Either side of the books with the vases on were teacups, these teacups were filled with truffles handmade by little sister and myself. These truffles went down a treat there were three flavours peanut butter (obvs because I am obsessed), red velvet and salted caramel. 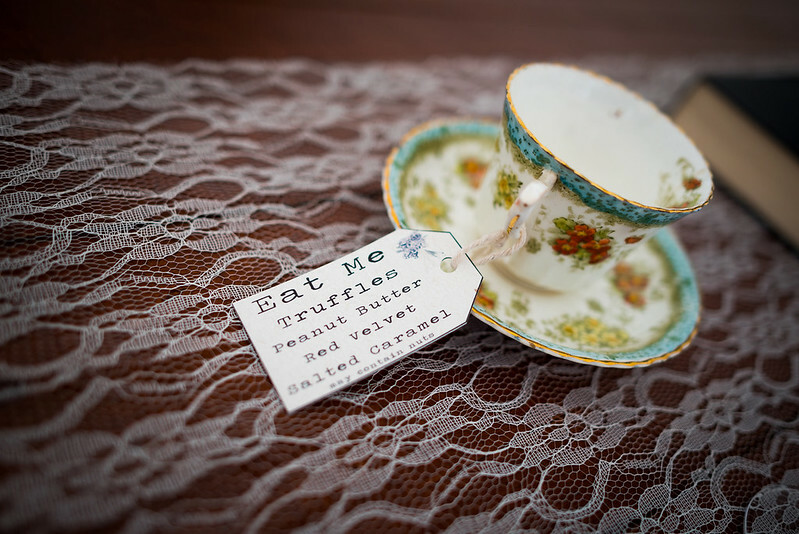 The eat me cards were something else I created and again ran along the same theme as all the stationary. Next to the tea cups followed small wooden mats that my Stepdad had chainsawed from some large tree branches. If you do do this yourself make sure you varnish them quick as they start going funny. I did not do this and had throw them all away after. On top of the wood was what were Douwe Egberts coffee jars. Luckily where Glenn worked this was the coffee they had so every know and then he would come home with a box full of empty jars. They were just perfect to sit on top of the wooden mats with beautiful flowers in. Next to the coffee jars were 3 jar candle handles. 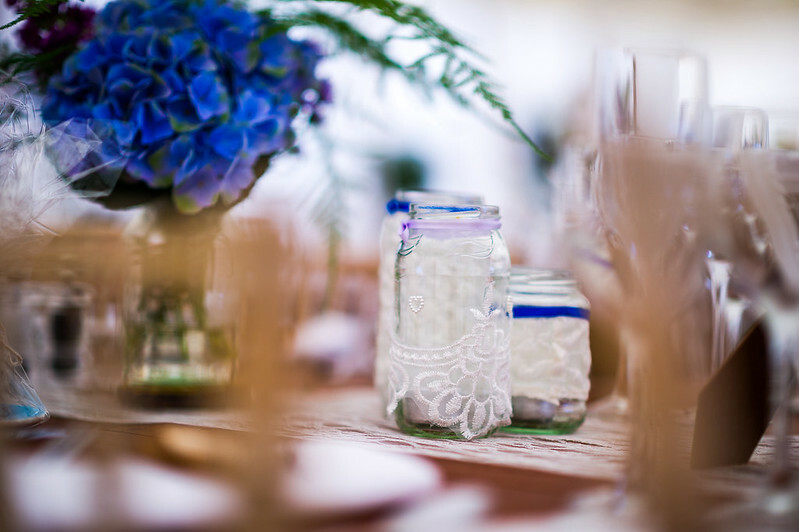 These jars were all different sizes and all decorated with lace, pearls and ribbon. Something my bridesmaids helped me out with months in advance. There were quite a few glue gun finger burns from creating these but they really helped add the finishing touch. 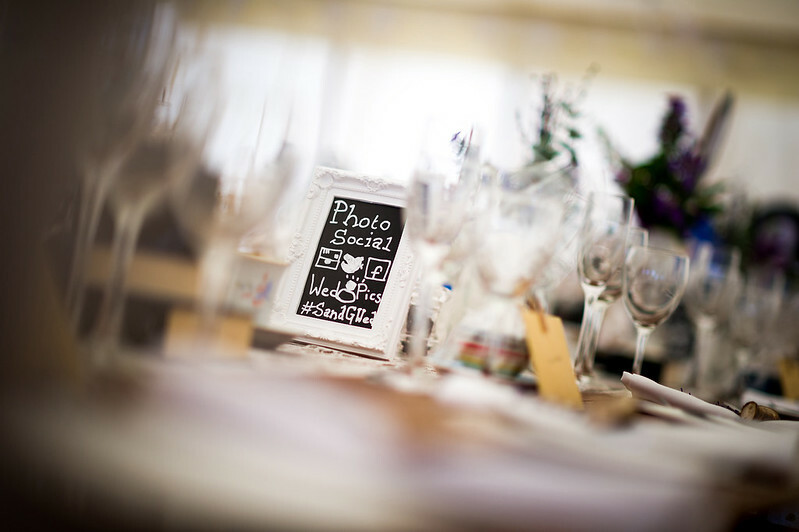 The last item that was dotted around on the tables were the frames from poundshop that I had painted with chalk paint and then added the relevant information for sharing images on social media. Each one of these I hand wrote and attempted to draw the social media icons. I am not great at drawing but it seemed to work. Within the main vintage vases the mini vinyls with the decoupaged table names were added. I put these on long sticks. As the glue gun wouldn't hold these I had to add duck tape to keep them attached to the sticks. 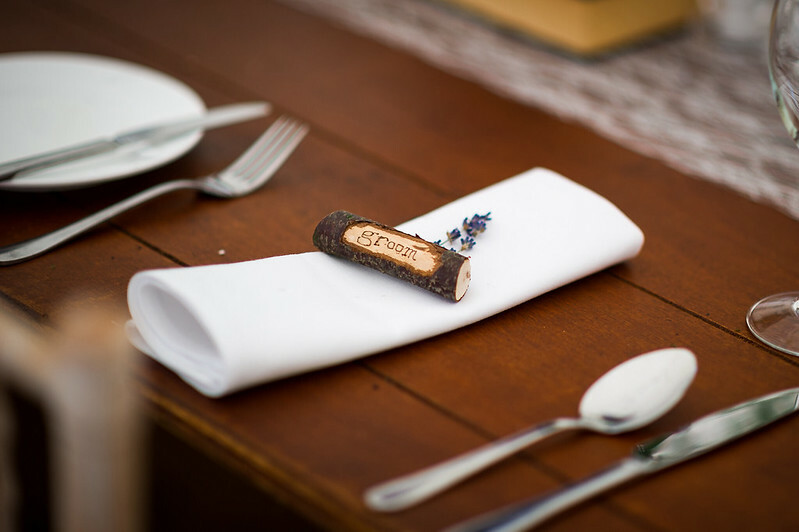 The names on the table were created from twigs that had been cut, scraped and then the names burnt into. Now this was the biggest and longest job I had set myself. Burning 99 names into wood was a mission, however I had never seen it done before and knew I wanted something different so again it was definitely worth it. Especially when a lot of people took them home. My last area I want to share is the bake off area. 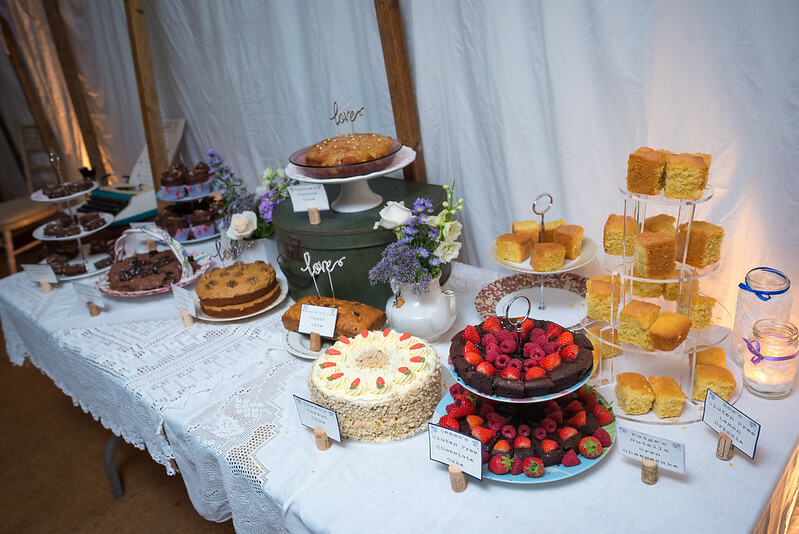 My sisters boyfriends Mum had very kindly leant me these beautiful lace table clothes we used on the cake area which was then stacked with a mixture of cake stands and a vintage case. In the evening these were all filled with cakes that the bridesmaids, my Dad and my now Mother in law had made. 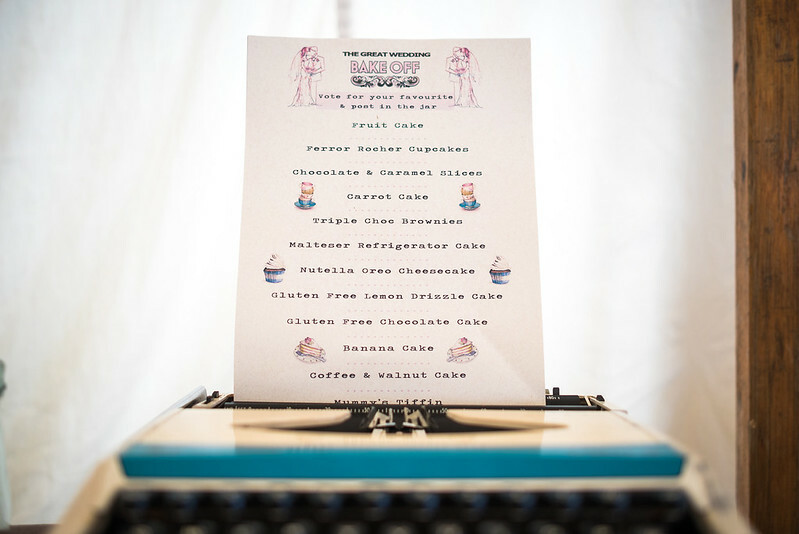 The vintage case table was topped with an old typewriter to display the list of cakes and then voting cards. I however did not get to announce a winner cos everyone cheated ha, but all the cakes were so delicious (I 100% made sure I had a taste of each). This added area really helped top the personal feel we wanted for our wedding. I was always be thankful to everyone for taking the time to create those cakes and help with all the decorations. I truly have great friends and family. Now if you have made it all the way to the end of this post I am truly impressed. 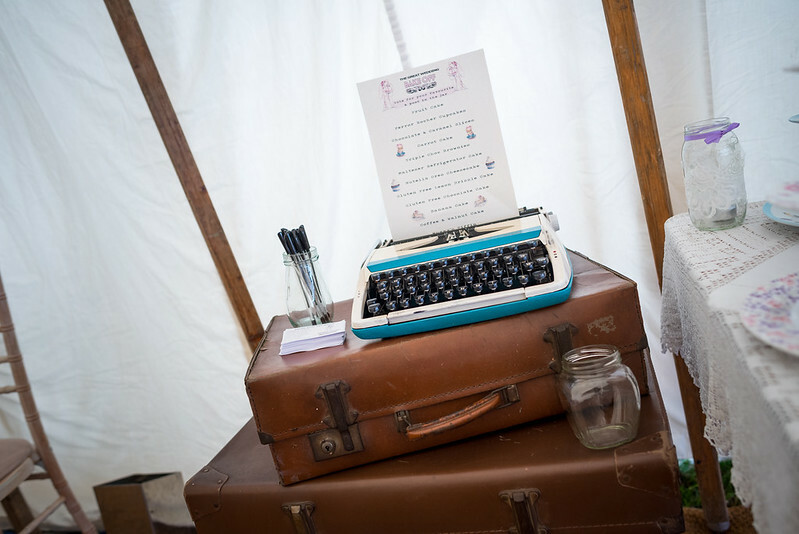 Thank you for taking the time to read this and yet again I have loved going back to my wedding day and sharing what we did. Have a fab weekend everyone. Beautifully done! I like the whole setup. I am planning a wedding in one of the Los Angeles wedding venues and the Marquee seems like a great addition. Now I'm going to check out part 1. Great post. Thanks for sharing ideas!